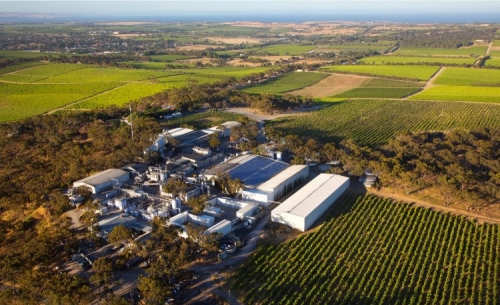 D'Arenberg Wines is located in the McClaren Vale area of the Fleurieu Peninsula, South Australia, where grape growing and wine production has a history dating back to the early 19th C when John Reynell planted the first vines here in 1838. 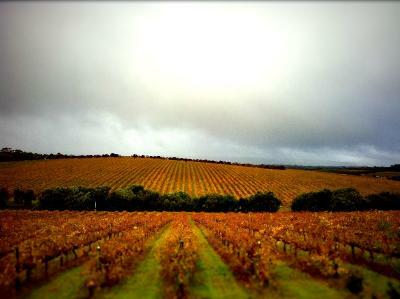 It was in 1912 that a teetotaller, one Joseph Osborn, purchased Milton Vineyards, a well known estate of 25 hectares. Such was the success of the business that his son Jack left medical school to work at the property and subsequently increased the area under vine to 78 hectares. Grapes were sold to wineries in the area until he was in a position to build his own which was completed in 1928 and production of both dry red table wines and fortified wines began, principally for export to Britain. In 1943 Jack became ill and his son Francis, then 16, left school to help his father run the business assuming full control in 1957. Within two years he had launched his own label, d'Arenberg, using his mother's maiden name from which his nickname of d'Arry originated. Within a few years d'Arenberg wines were winning trophies and medals at some of the most important wine shows in Australia gaining approval from both wine drinkers and judges. By the 1970s the label had established an international reputation for the quality of its wines. The company is now run by d'Arry's son Chester d’Arenberg Osborn, the fourth generation in charge of this family owned winery. Having been raised with such strong wine making tradition Chester studied viticulture and viniculture at Roseworthy, Australia's pre-eminent wine college. After graduation he had stints at other wineries in Australia as well as in Europe before taking over as head winemaker at d'Arenberg in 1984 with a philosophy of minimal intervention in both vineyard and winery. Examples of this approach are the avoidance of fertiliser and irrigation wherever possible and not cultivating the soil all of which help to intensify the natural flavours of the "terroir" as well as forcing the roots to dig deeper in search of water and nutrients. This practice is extended to the contracts signed when D'Arenberg buys in grapes from other growers thus maintaining a consistent approach to its winemaking. The vineyards from which d'Arenberg sources its fruit include its own Osborn estate property in the McClaren Vale whose 78 (mostly ironstone and chalk rock) hectares include Shiraz vines planted in 1912, Grenache and Mourvèdre from 1918 and Cabernet Sauvignon from the 1950s. The Pedler’s Divide Vineyard adjoining Osborn was purchased in the late 1990s and is planted with a diverse range of grape varieties that includes Petit Verdot, Tempranillo, Souzao, Tinta Cao, Marsanne, Viognier, Sauvignon Blanc and Roussanne alongside the varieties planted at Osborn. Other vineyards providing grapes for d'Arenberg are The Mustard Block, The Bamboo Ridge, The Ege Vineyard (complete with 108 year old vines), Wilcadene, Little Venice and Adelaide Hills. The latter is a source of superb cool climate Chardonnay as well as Viognier, Sauvignon Blanc, Pinot Noir and Merlot grapes. Altogether D'Arenberg owns 200 hectares of vineyard and buys in grapes from 120 growers. The McClaren Vale has an excellent Mediterranean type climate for ripening grapes with very warm, dry summers and cooler, wet winters so it's no surprise that Rhone varieties excel here. Humidity is very low as the harvest draws near and its close proximity to the coast helps to moderate temperatures and lengthen the growing season allowing the flavours within the grapes to develop complexity. None of this precludes the existence of a variety of micro-climates in the region, however, and the four generations of experience that D'Arenberg has accumulated allows its knowledge of the various sites to inform its winemaking in terms of understanding the performance potential of each grape variety along with its vinification, whether that be as part of a blend to add greater complexity or as a single vineyard varietal from the very best sites. Winemaking at D'Arenberg is still carried out in time-honoured traditional ways. The fruit is still trodden by foot and pressed using two wooden "basket-presses" dating from around 1860 and a third copy that d'Arenberg had made in 1940. The gentle action of these pieces of equipment is treasured. For White wines, the grapes are pressed before fermentation and oxidation is prevented by enclosing the whole press in a giant plastic bag and kept cold by dry ice. The Reds are pressed after fermentation in open tanks allowing both the process itself and the alcohol to extract both colour and tannins. 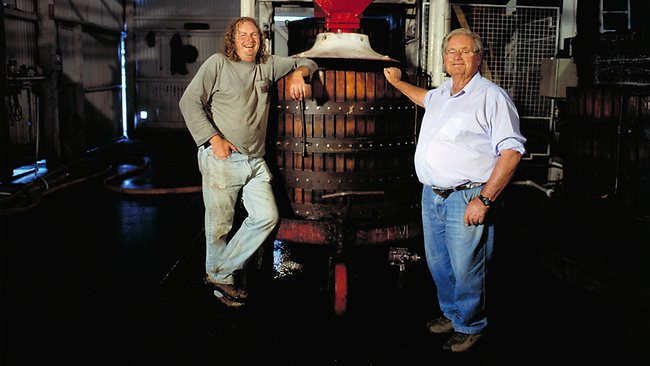 D'Arenberg is the only winery in Australia to use a basket-press for its Whites as well as for Reds. 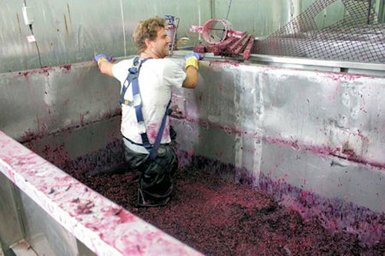 Head winemaker Chester says that the juice is filtered by being drained through the pulp which results in a clearer liquid requiring less time to settle and clear afterwards - another example of minimal intervention. Further, all parcels of grapes are vinified separately allowing them to fully express their character, giving a true assessment of its qualities prior to blending. 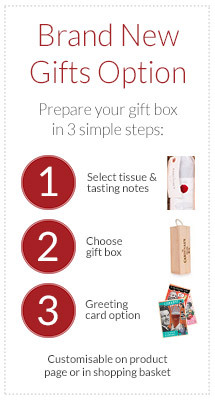 The aim is to produce wines that combine the best fruit palate texture with fragrance and length of finish. A good balance of acidity and complex tannins are also of crucial importance to Chester who will taste thousands of parcels of wines before deciding on final blends. "This admirable portfolio, made by the multi-talented Chester Osborn, includes brilliant quality at the top, very fine wines in the mid-range, and terrific values at the bottom. D'Arenberg also does as well with whites as with reds, and produces a bevy of impressive fortifieds." Australian wine expert James Halliday is similarly impressed. The rarest of the range is a series of single vineyard varietal Shiraz and Grenache wines that truly express the terroir of each vineyard and the personality each variety of grape develops on the vine each vintage. Chester's dedication to McClaren Vale has resulted in an ability to create wines of this quality which make up the Amazing Sites range. Next come The Icons which Chester says are the pinnacle of the d'Arenberg range. These are the wines upon which its long-standing reputation has been built. These are The Ironstone Pressings Grenache Shiraz Mourvedre blend (67% Grenache, 27% Shiraz, 6% Mourvèdre) which takes its name from the iron oxide rich ironstone granite widespread in McClaren Vale, The Coppermine Road Cabernet Sauvignon, named after the road that runs past the winery itself and d'Arenberg's best Cabernet vineyard and finally The Dead Arm Shiraz named after a fungal infection that causes one half, or arm, of the vine to wither and slowly become dead wood whilst the other produces incredibly intense, concentrated fruit with very low yields. All three wines are made from extremely old vines with concomitant low yields and are the result of both traditional winemaking techniques and a stringent barrel selection process. The wines, though massive, show great restraint even when young and are claimed to last a lifetime when cellared correctly. Following this are several other ranges of wine encompassing more than 60 different labels from 30 grape varieties; the super-premium Artisans range featuring Chester's signature, a high altitude range including The Feral Fox Pinot Noir, The Originals which harks back to the 1960s when bottles of d'Arenberg first sported the now well-known red stripe of which The Footbolt Shiraz, The Olive Grove Chardonnay and The Hermit Crab Viognier/Marsanne blend deserve a special mention. There is even a range of wines for everyday drinking named The Jump Stump series - named after the plough which was invented in the region to clear the vineyard land was subsequently exported to many parts of the world to clear rough ground - all single varietals with the exception of a Grenache Shiraz Mourvedre blend. The latest d'Arenberg wine sees white sparkling DADD, a blend of Pinots Noir and Meunier, added to its The Peppermint Paddock Sparkling Chambourcin red which is made from a hybrid grape variety. To complete the line-up white dessert wines and a fortified port-like Shiraz are also produced.